The Mandalay Bay is considered one of our all-in-one fiberglass swimming pools. 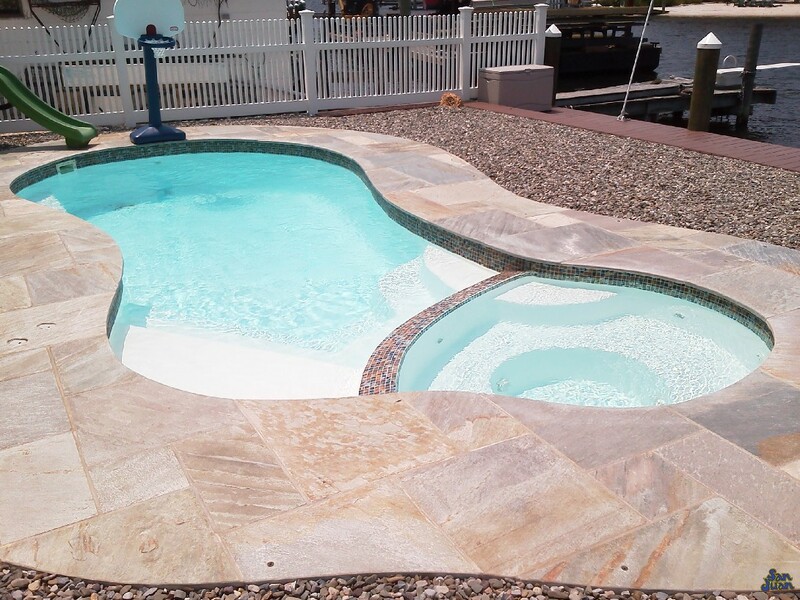 It includes a free form shape, attached spa, dual entry steps, bench seating and modest deep end. If you’re looking for a fiberglass pool that does it all, chances are the Mandalay Bay is the perfect selection for you! 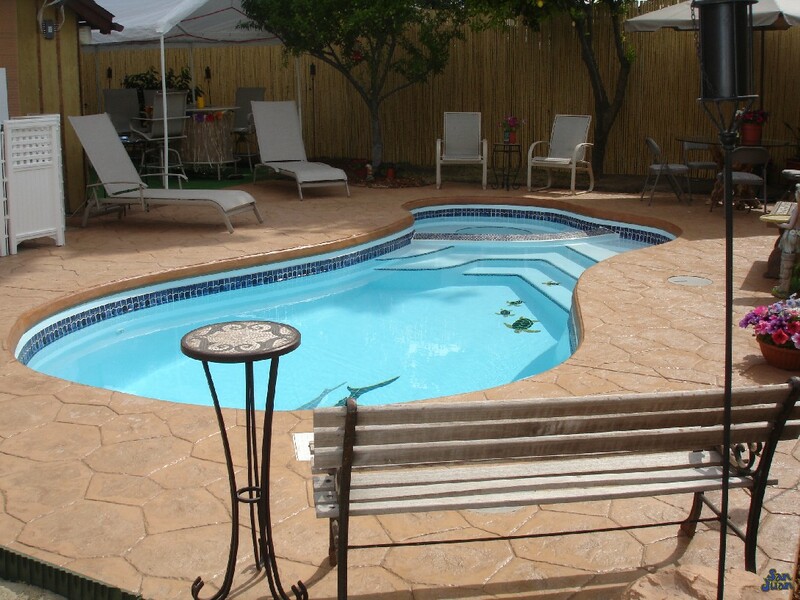 What would San Juan Pools be if we didn’t give you the option of getting all of your desires fulfilled with one swimming pool? Well, we thought the same thing so we created the Mandalay Bay! 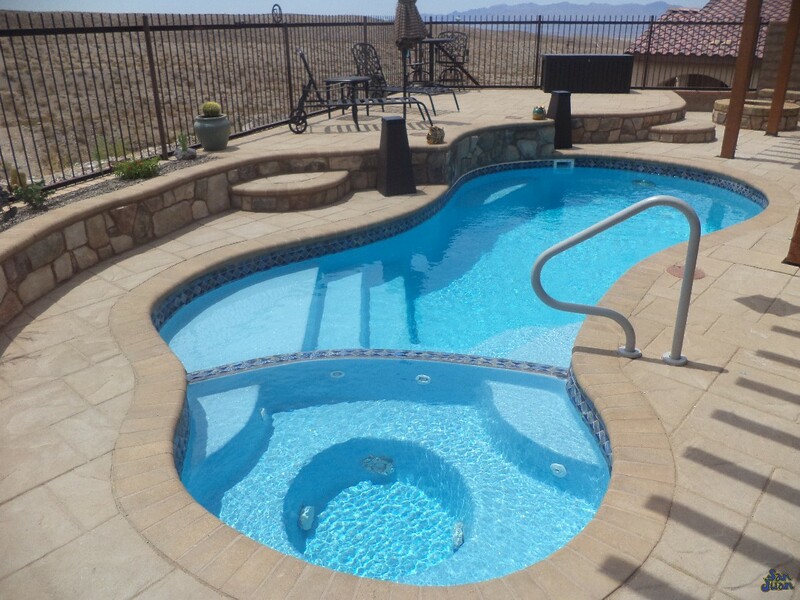 This gorgeous fiberglass pool belongs in a category all on its own. To summarize it best, the Mandalay Bay could be considered an all-in-one fiberglass pool. What makes it so great? Let’s take a closer look. At first glance, looking at the Mandalay Bay you may notice it’s small / medium sized shape. It’s not a huge body of water, however, it includes a wide array of design features. For starters, its free form shape provides a fun layout that is interesting and attractive. Secondly, this shape includes (out of the box) an attached spa. This is a huge selling point for those who want the most bang for their buck. In addition to the attached spa, the free form shape gave us an opportunity to include a set of dual entry steps. We’ve actually located entry steps on both sides of the shallow end. 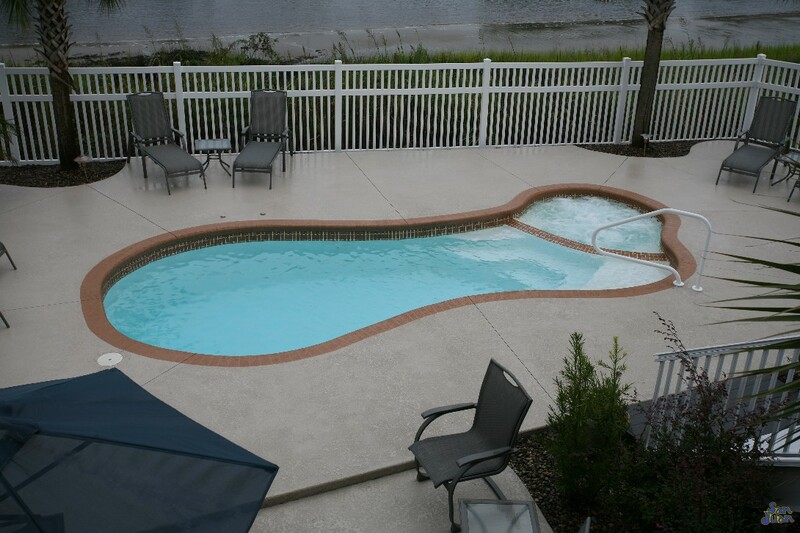 We guess you could say that this pool shape is meant to entertain and be fully functional. The Mandalay Bay includes a modest deep end of 5′ 7″. It’s not meant for diving, but is perfect for casual raft floating or shooting some hoops. In addition, it’s modest size of 6,600 gallons makes the Mandalay Bay perfect for small to medium sized backyards. 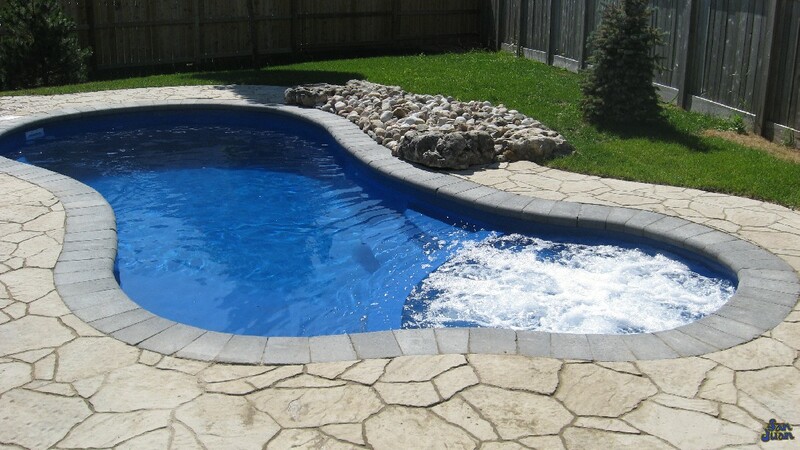 In essence, you could fit this fun fiberglass pool into almost any backyard. Another great feature of a petite pool shape, like the Mandalay Bay, is the ease of maintenance. Smaller bodies of water require less chemical maintenance. 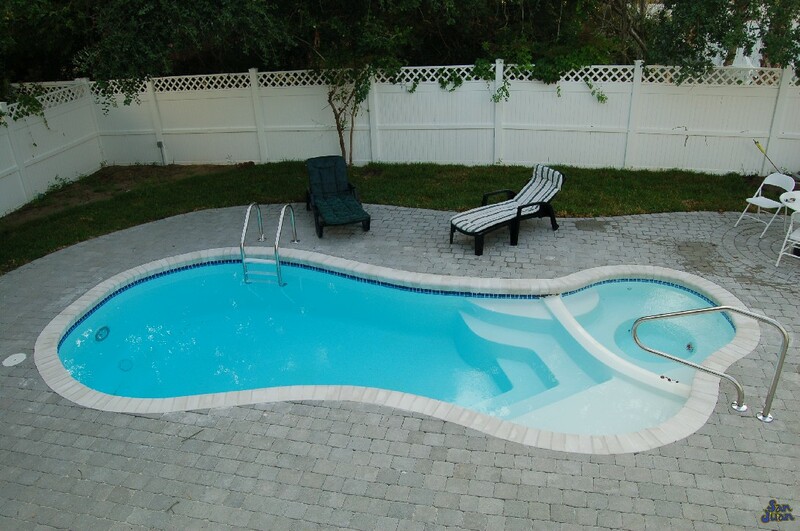 Therefore, you’re helping your pocketbook while providing a beautiful swimming pool for the whole family to enjoy. That’s a win-win in our book! In conclusion, the Mandalay Bay is an exceptional free form fiberglass swimming pool. It can be considered an all-in-one model because of the many feature that it holds in its petite frame. From a free form shape, to attached spa, dual entry steps, and modest deep it; it has it all! We know that you’ll love the Mandalay Bay just as much as we do!